Bedtime stories are a favorite ritual for parents and young kids. Snuggling in bed together while you turn pages, point to favorite pictures, and teach your child to recognize objects and words is both a learning and a bonding experience. 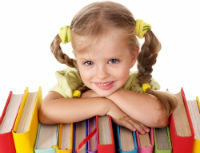 Research has shown that reading to a child starting at an early age can actually enhance IQ. Here are some ways you can make the most out of reading to your child. It is never too early to start reading to your child. Infants can begin to show interest in black and white contrasted patterns and shapes as young as two months of age. Sit with your baby on your lap and hold a developmentally appropriate picture book 12 to 18 inches away from baby. Trace the patterns with your fingers. Use your voice to hold baby’s interest. You will find your baby’s attention span is very short in the early months, so don’t push baby to stay focused. Keep it fun. As baby grows through 4 to 6 months of age she will enjoy reaching out, grasping and interacting with activity books. Make this a daily routine so your child becomes used to it and even grows to expect it. Find a time when baby is in a quiet, relaxed mood. As baby gets older, show her how to manipulate the objects correctly, such as zipping zippers, pulling off Velcro objects and putting them back on, undoing buttons, touching baby’s face in a mirror and making crinkle or rattle sounds. Be sure to continuously engage your baby’s attention with your voice. “Turn the page,” “Where’s the ball?,” “Open the door” and any other phrases that apply to your book will really work your child’s mind. As they grow through the second year of life you can introduce the concept of colors when reading to your child. Pick one or two colors to focus on and repeat them over and over. And there’s no better way to learn animals and animal sounds than by pointing them out in a book and making the sounds with your child. When you begin reading storybooks, don’t just read the words. Make up the story yourself in a way that holds your child’s interest and imagination. Reading books that match your child’s favorite movie or TV characters will really get your child excited about reading. As your child gets older, start reading the story words as you deem appropriate to your child’s age. Simple phrases such as classic nursery rhymes are a perfect place to start. Reading to your child is a timeless activity you should continue through the preschool and elementary years as long as possible. Read a chapter each night to your older child and have your child read a chapter to you in turn. This keeps you involved with your child’s imagination. You will not only be fostering a love for reading, which will have academic benefits, but you will be creating memories for your child to look back upon fondly so that they will in turn share this experience with their own kids someday.